Bangkok (Thailand) – May 18, 2018 (travelindex) – Best Western Hotels & Resorts is celebrating after BluPhere Pattaya, BW Premier Collection by Best Western, its spectacular new seafront property being developed by the Habitat Group, was honored at the Asia Pacific Property Awards 2018-19. This impressive upscale hotel won the “New Hotel Construction & Design – Thailand” award at this year’s Asia Pacific Property Awards. Organized by IPAX Asia Pacific, this prestigious event celebrates architectural excellence and showcases the region’s finest hospitality and real estate developments. This award marks the latest in a series of accolades for BluPhere Pattaya and Habitat Group, Thailand’s leading real estate developer. Mr Chanin Vanijwongse (pictured left), the company’s Chief Executive Officer, and Ms Sasivimol Sutthibut (right), Chief Operating Officer, were at the event to receive this prestige award. Scheduled to welcome its first guests in 2020, BluPhere Pattaya, BW Premier Collection by Best Western, is a stunning new project being constructed by the Habitat Group in Na Jomtien, the beautiful beachfront destination on Thailand’s popular Eastern Seaboard. The development’s contemporary design concept blends perfectly with nature, including the sky and sea, allowing guests to immerse themselves in the blissful seafront surroundings. “One of the most important elements of hospitality is developing lasting relationships. In the Habitat Group we have a fantastic partner that is able to create inspirational projects. We look forward to deepening our relationship with them in future and seeing BluPhere Pattaya and other exciting projects come to life,” Olivier added. 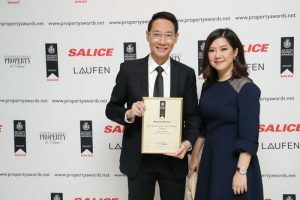 BluPhere Pattaya has won several awards for its architecture and design, including “Best Low-Rise Condo Architectural Design (Resort)” at the Thailand Property Awards 2017. It was also highly commended in the “Best Condo Interior Design” and “Best Condo Landscape Architectural Design” categories. It then won the “Best Condo Architectural Design (Thailand)” title at the Asia Property Awards 2017. Currently under construction, BluPhere Pattaya will become the second BW Premier Collection by Best Western hotel in Thailand. Located just 100 meters from the golden beach, the hotel will feature 199 spacious apartment-style units and an array of upscale amenities. Best Western and Habitat Group are also working together on Best Western Premier BayPhere Pattaya, which is scheduled to open in 2019. Best Western Hotels & Resorts headquartered in Phoenix, Arizona, is a privately held hotel brand with a global network of 4,100* hotels in more than 100* countries and territories worldwide. Best Western offers 10 hotel brands to suit the needs of developers and guests in every market: Best Western®, Best Western Plus®, Best Western Premier®, Vīb®, GLō®, Executive Residency by Best Western®, and BW Premier Collection®; as well as its recently launched franchise offerings: SureStay®, SureStay Plus® and SureStay Signature Collection®. Now celebrating more than 70 years of hospitality, Best Western provides its hoteliers with global operational, sales and marketing support, and award-winning online and mobile booking capabilities. Best Western continues to set industry records regarding awards and accolades, including 64 percent of the brand’s North American hotels earning a TripAdvisor® Certificate of Excellence award in 2017, Business Travel News® ranking Best Western Plus and Best Western in the top three upper-mid-price and mid-price hotel brands for three years in a row, and Best Western receiving seven consecutive Dynatrace® Best of the Web awards for its leading hotel website. Best Western has also won eight consecutive AAA®/CAA® Lodging Partner of the Year awards, recognizing the brand’s commitment to providing exceptional service and great value to AAA’s 56 million members in the U.S. and Canada. Over 30 million travelers are members of the brand’s award-winning loyalty program Best Western Rewards®, one of the few programs in which members earn points that never expire and can be redeemed at any Best Western hotel worldwide. Best Western’s partnerships with AAA/CAA and Harley-Davidson® provide travelers with exciting ways to interact with the brand. Through its partnership with Google® Street View, Best Western is the first major company of its size and scale to launch a virtual reality experience for customers, setting a new industry standard and reinventing how guests view hotels.